Just finished this 3 piece bedroom set. Had a few too many dings to repair so I ended up having to go with the dark stain on it, but I think it turned out pretty good! 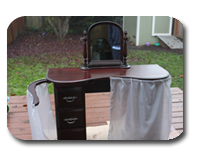 This vanity was literally falling apart (as you can see from parts on the ground) and the inside drawer rails were all rotted out. Took A LOT of TLC for this one!!! 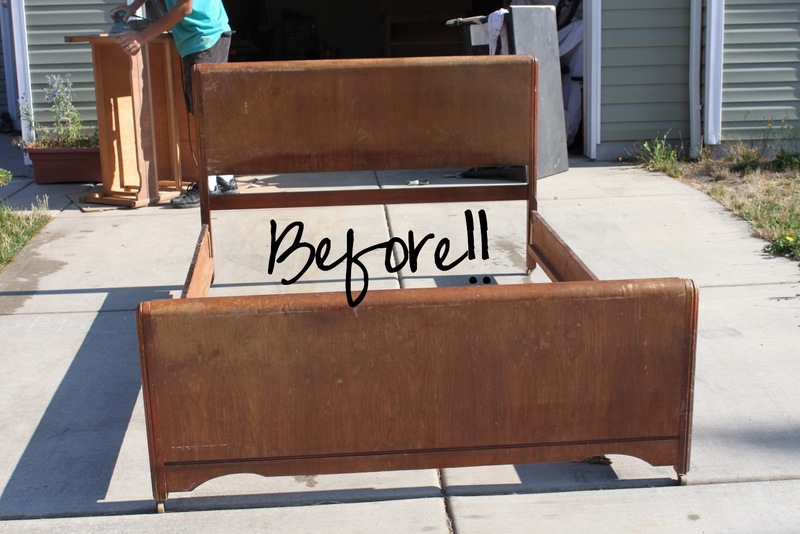 This dresser was greatly neglected. I snagged it hoping to restore the wood finish but it was way too damaged. 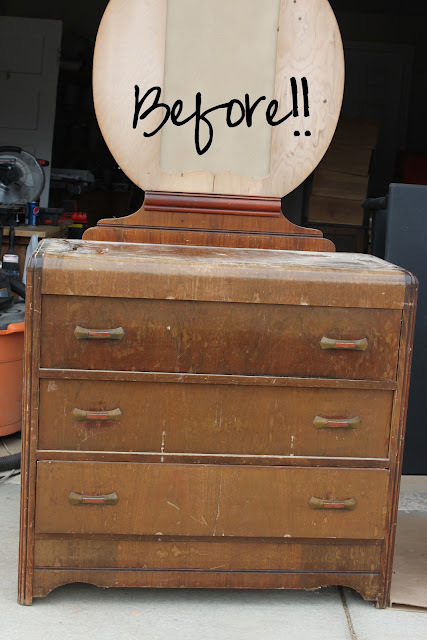 There was no way to fix up the outside so the original wood could shine through. It also could barely stand on it's own and none of the drawers worked, nor did they have supports. I completely reinforced all the drawers and have them all working great. I also had to actually paint this project. 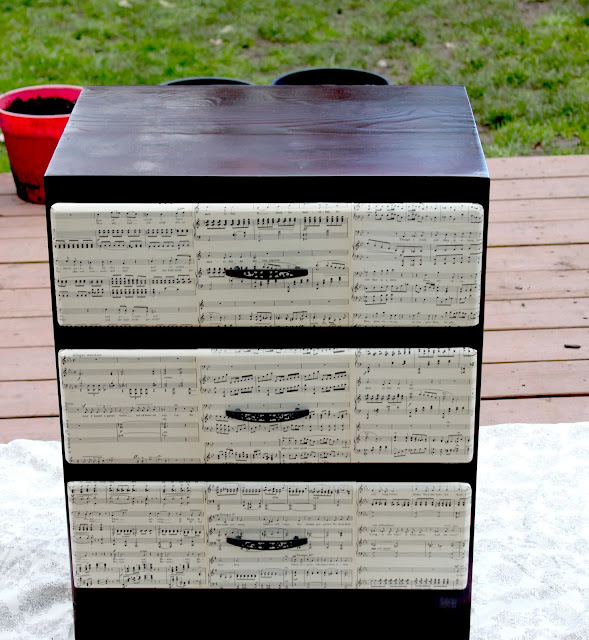 (And if you've seen my work, you know I normally take paint OFF wood, not put on. However, there was no choice this time.) This piece is for sale for $225. Found another old desk that looked fun to work with. Wasn't quite sure what I was going to do with it, however. Once I started sanding off the darker stain, a gorgeous knotty pine was revealed underneath. I immediately knew I wanted a light stain to accent the beautiful grains and knots of the wood. After having had so much fun with the old sheet music on the last project, I wanted to see how it would work on a lighter colored piece of furniture. 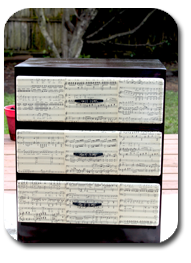 Though the desk had gorgeous grains on the top and sides, the drawers were not the nicest wood, so they were perfect to cover with the music. Again, another to add to my favs! Picked up this little beat up side table/dresser. It was in need of a little TLC. Thought I'd try something different on the drawers. 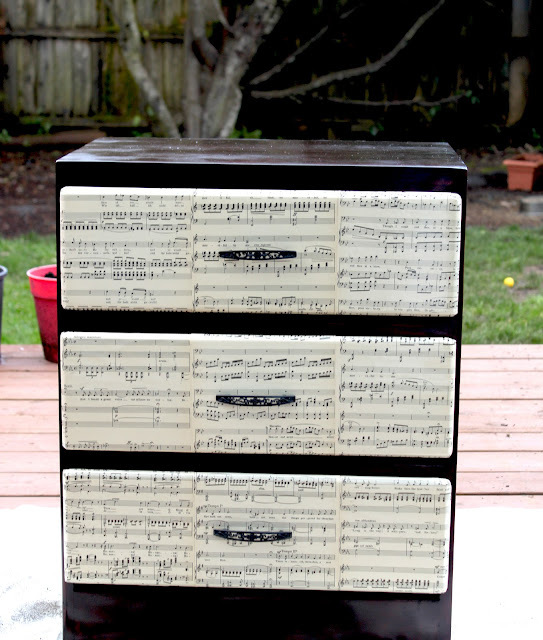 A few VERY old sheets of music, some mod podge, a little stain and this is what I ended up with! I must say that this has been added to the list of my fav projects. And the bed is finished!!! Getting ready to install support beams once bed was already moved upstairs. The headboard and two side boxes detaching make it very convenient to move around. Found a beat up/broken sleigh bed a while back. Decide I could work with it. Refinished the headboard to match my bedroom. The changes are subtle. 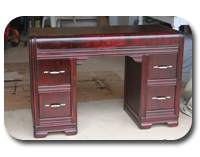 Took the old stain off and restained to match what I already had. Slightly lighter with a bit of red. Found this fixer-upper on Craigslist a few days ago. My favorite part was the detail on the front with all the carving.